Professor John Skrentny has a new book published. It’s called After Civil Rights: Racial Realism in the New American Workplace (Princeton University Press). He has presented material from it at several law schools, many of which were holding special events to commemorate the 50th Anniversary of the Civil Rights Act of 1964. He and Kevin Lewis also won a couple of grants for research projects focused on the STEM workforce. In other news, he claims to have found a pretty good new local burrito: Kotija Jr. Taco Shop, 2690 Del Mar Heights Road, 92014. Professor Charlie Thorpe and graduate student, Brynna Jacobson presented a paper at York University in Toronto for a conference on the Changing Political Economy of Research and Innovation. 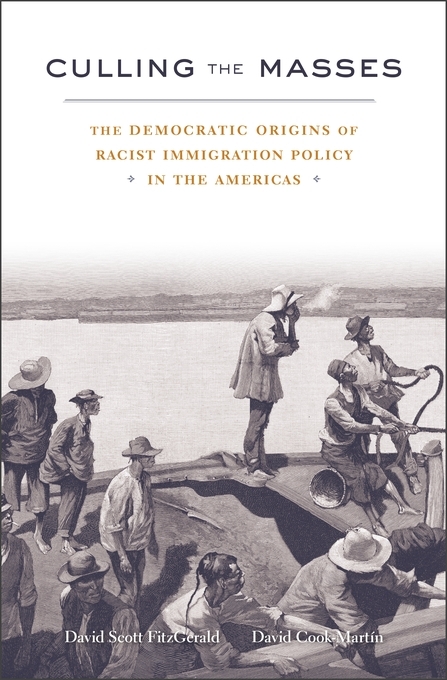 Prof. FitzGerald’s upcoming new book, Culling the Masses: The Democratic Origins of Racist Immigration Policy in the Americas will be available in April thru Harvard University Press. Culling the Masses questions the widely held view that in the long run democracy and racism cannot coexist. David Scott FitzGerald and David Cook-Martín show that democracies were the first countries in the Americas to select immigrants by race, and undemocratic states the first to outlaw discrimination. Through analysis of legal records from twenty-two countries between 1790 and 2010, the authors present a critical history of the rise and fall of racial selection in the Western Hemisphere. Congratulations to grad student Angela Garcia, whose article, “Hidden in plain sight: How unauthorized migrants strategically assimilate in restrictive localities in California” has been accepted for publication in the Journal of Ethnic and Migration Studies.